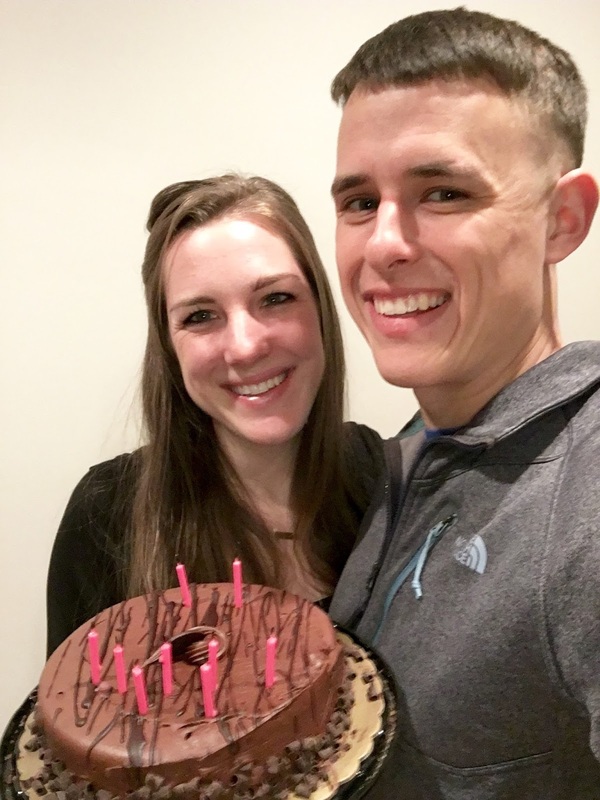 This past weekend, Parker and I celebrated my 27th birthday! He kept walking around the house saying "Can you believe you're 27?!". Glad to know he thinks that sounds as old as I feel. You can always count on husbands for an uncensored reality check! We celebrate birth weeks around here, so the whole weekend really felt like my special day. I told Parker it was my goal to call it "my special day" as often as possible. Obnoxious, yes, but it only happens once a year! 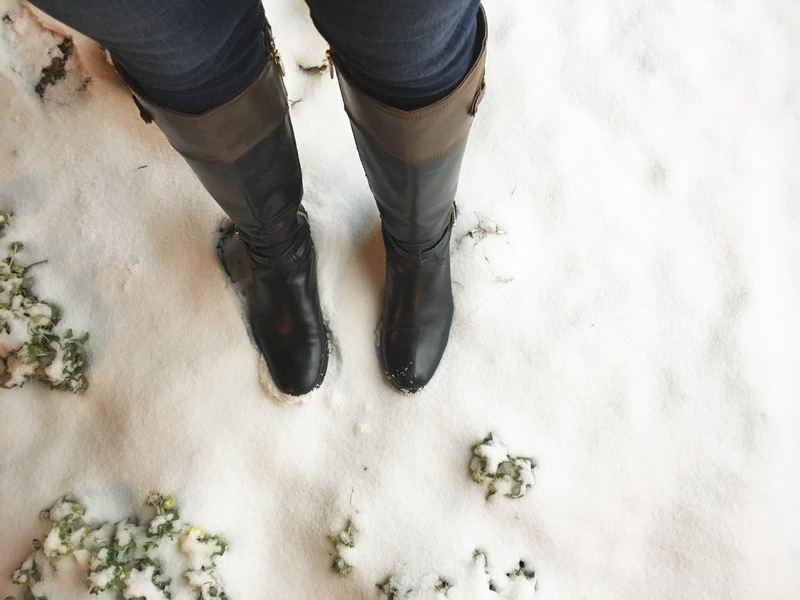 It was absolutely freezing this weekend, and we had our second snow of the year. We only got a couple of inches, but with temps in the 20s, we felt like we were living in an igloo! That white stuff sure is pretty though. 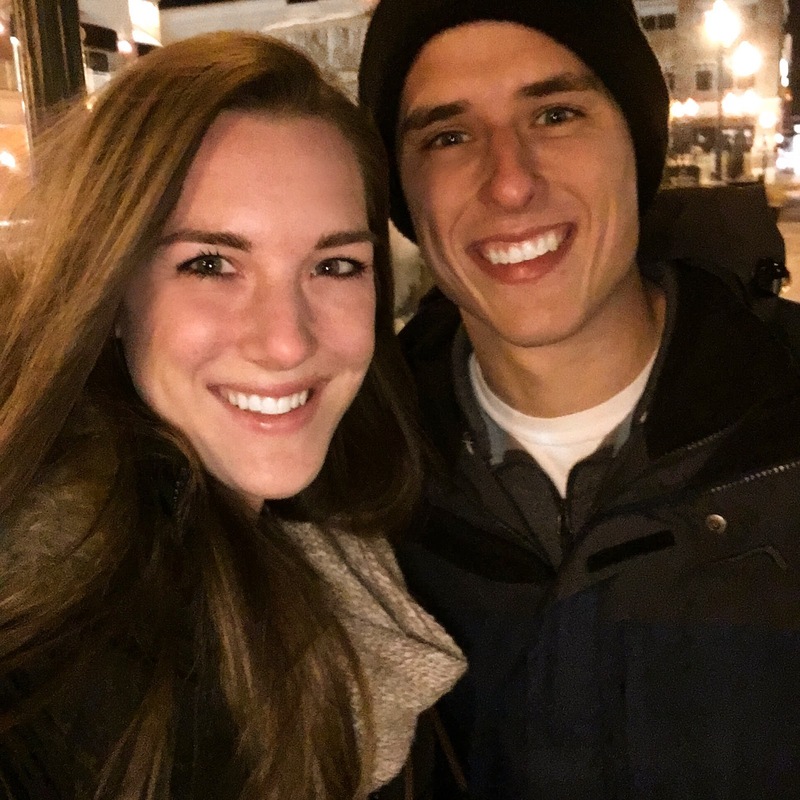 We kicked the weekend off Friday with a little date night to The Cheesecake Factory. I was trying to think of a fun place we haven't been in a while, and then I remembered if I go there I get cheesecake, so that's how that decision was born. A yummy dinner and a piece of Dutch Apple Caramel Streusel Cheesecake later, and we were happy campers! We bundled up afterward and went on a little walk around our favorite area of Virginia Beach. We could spend every Friday night there and be so happy about it! "How To Be Single" was my movie of choice to round out the dinner and a movie date night, and it was quite cute! Saturday we slept in (because when it's your birthday, you win the "please don't set an alarm" debate that we have every Friday night) and hit the gym for a little workout. 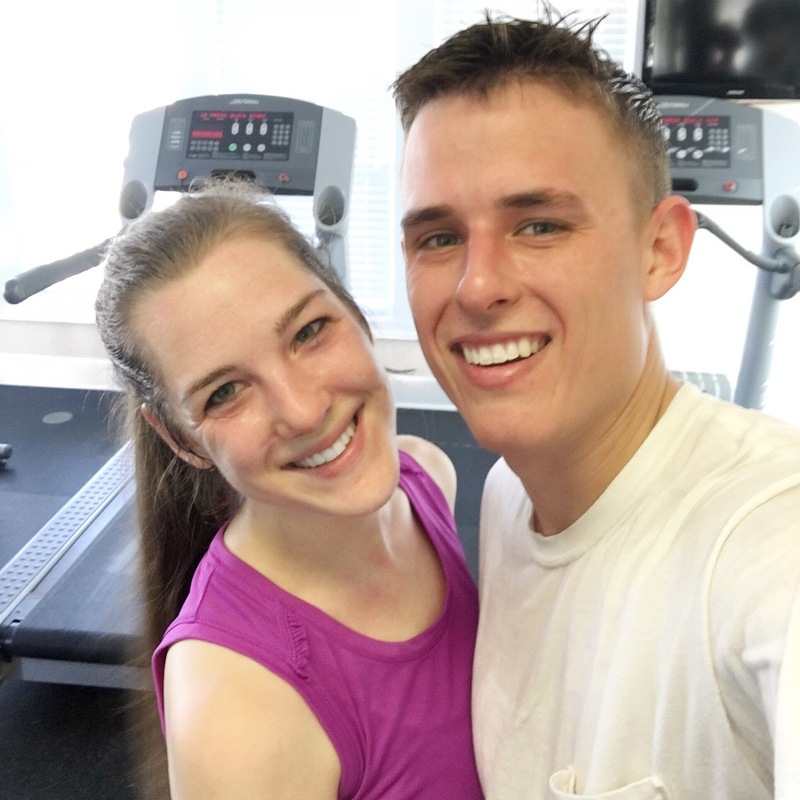 Holiday weekends typically center around food, so we knew a nice run would make us feel better! There is something really fun about running on the treadmill and seeing your buddy on the next treadmill over doing the same thing. That said, 30 minutes goes by much slower on that thing. It's just science. We planned to cook breakfast after and stopped at the grocery store for some bacon and chocolate milk. #necessities. 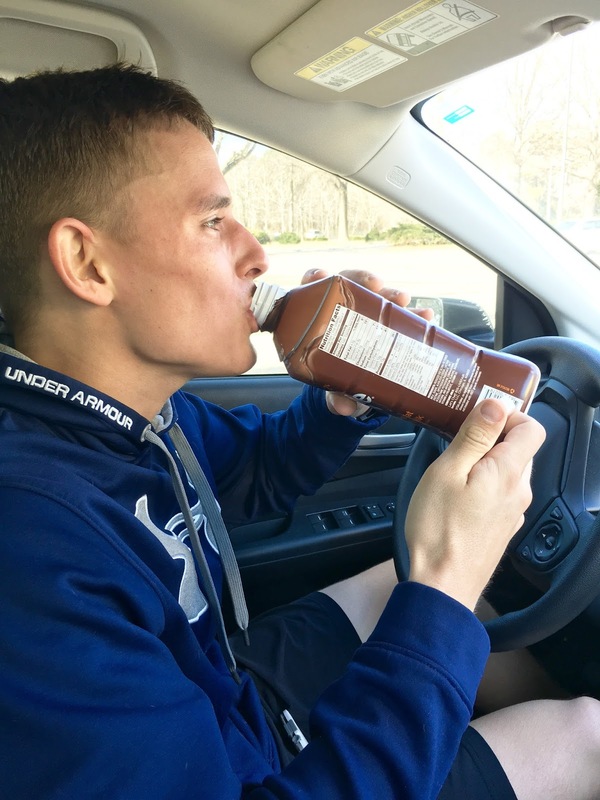 The chocolate milk was apparently too delicious to wait to drink until we got home, because I looked over and saw Parker chugging away at the bottle before we even left the parking lot. I'd be lying if I said I didn't do the same thing. Since we were so productive in the morning, we literally laid on the couch the rest of the day like lounge lizards watching Downton Abbey and Friends. I wasn't mad about it. Sunday was my actual birthday, so I was officially kicked out of the 26 club. Even though I have mixed feelings about turning 27, I am fully convinced that Valentine's Day is the best birthday ever. You get class parties as a kid and chocolate as an adult. Boom. Best birthday ever. We went to church, hung around the house, and rounded out the evening with a Chili's date and birthday cake. Parker got me a cake this year, which I am pretty sure is the first year he has done that. I was so surprised and excited! I love me a good slice of cake. In his words "I went into the store, and this cake just screamed Chelsea". It's chocolate on chocolate on chocolate. Well done, husband. Well done. As all weekends do, it ended way too quickly, but it sure was wonderful while it lasted! Looking like an awesome birthday! Looks like 27 won't be that bad. 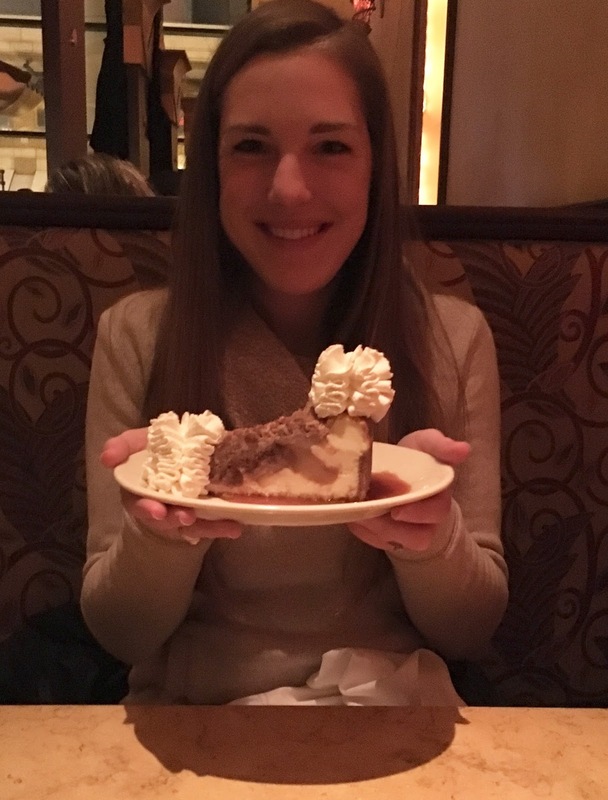 What a fantastic birthday weekend, I am so jealous of your dinner at Cheesecake Factory! I wish we had one close. It looks like you had a wonderful birthday weekend! I'm curious though-- do you and Parker celebrate Valentine's Day since it is the same day as your birthday? Happy Birthday! Looks like a great weekend to round out the birthday week! Looks like great birthday to me! There is a Cheesecake Factory that opened up by work a few years ago...still have yet to visit! Maybe this was the inspiration I needed. Hope you had a great birthday! That cheesecake looks so amazing!! Happy Birthday! Looks like an awesome weekend! Wish we had a Cheesecake Factory close by - only get there once every couple years. What a fun birthday celebration!! Cheesecake Factory was a great choice!! Glad you had a fun birthday weekend! How fun!! I love how you guys celebrate the whole week/weekend!! Looks like a wonderful way to start 27. You can't beat chocolate on chocolate on chocolate! It looks like you had a great weekend to celebrate!